Andrew Bird In Concert With Loney Dear Bird is a gangly, classically trained violinist who mixes jazz, folk and quirky art-pop with whistled melodies. Along the way, he's attracted the kind of screaming crowds normally reserved for pop stars. Hear what hype is all about when NPR Music webcasts Bird's entire concert from the 9:30 Club in Washington, D.C., tonight, Feb. 3. The live stream will begin online at approximately 8 p.m. ET, with an opening performance by Loney Dear. 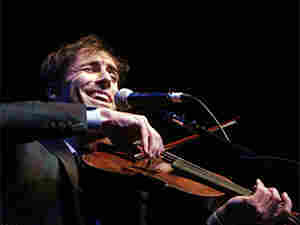 Andrew Bird is a gangly, classically trained violinist who mixes jazz, folk and quirky art-pop with whistled melodies. Along the way, he's attracted the kind of screaming crowds normally reserved for pop stars. At a recent show in his native Chicago, thousands of breathless fans came to see the singer, many of them shouting "I love you!" between songs. Hear what the hype is about with this entire concert, recorded live from the 9:30 Club in Washington, D.C., on Feb. 3. The show began with an opening performance by Loney Dear. Bird gives incredible live performances. Essentially a one-man band, he plays lines on violin or guitar or whistles a theme, then records and loops the sounds before playing new layers over them. "Every night," he says, "I am rewriting all my songs for the audience." Bird was born in 1973 and learned violin from a young age using the traditional Suzuki method. He graduated from Northwestern University with a degree in violin performance. Opening for Bird is Emil Svanagen, a Swedish singer and former pro cyclist who writes and performs as Loney Dear. Loney Dear's music is sweetly innocent and mostly joyful, with candy-coated layers of delicate tones and atmospherics. As with his 2007 debut, Loney, Noir, Svanagen recorded the new Dear John by himself in his living room and his parents' basement. For the 9:30 Club performance, Loney Dear will feature a full-band lineup, including Samuel Starck (keyboards), Malin Stahlberg (tambourine, vocals, keys), Ola Hultgren (drums) and David Lindvall (bass).